Nissan's 2013 Armada SUV is a big machine intended for big jobs. With seating for up to eight people, a smorgasbord of electronic media and navigation equipment, and a tow rating of 9,000 pounds, the Armada is indispensable for large families on the go. That is if they can afford the monthly fuel bill. I love the space and how reliable this vehicle is. I love this truck. It is perfect for the amount of equipment that we have due to our daughters special needs. The only issue is that it is a gas guzzler. We have put a lot of mileage on it and it has been very dependable and the only issue that we have had is the battery dying but all of the other parts have been very good and have held up. The best for teens that are just trying to get by. The gas goes super fast, but it does have very good features, comfort, etc. Also the look is very modern of this car. I recommend this cars to young adults or maybe moms of younger ones. I have found it very easy to clean also, my old cars have been hard to clean in the past. Love the Armada. Great space and great car. We have not had any major problems. 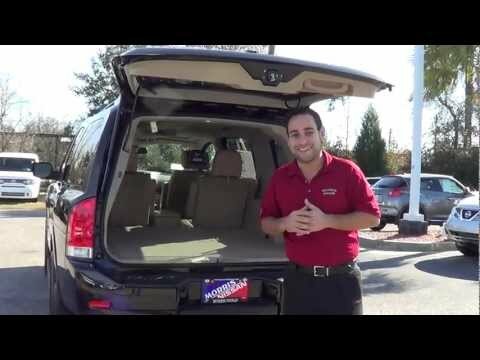 We love the space and the liftgate. My husband is very tall and he can fit comfortably in the car. It rides very well. It is hard to put adults in the 3rd row. We have plenty of room to take whatever we need when we travel. Nissan North America, Inc. (Nissan) is recalling certain model year 2013 Titan and Armada vehicles manufactured February 22, 2013, through May 3, 2013. The affected vehicles have a brake master cylinder which may intermittently reduce the pressure supplied to the front brakes. If the front brake pressure is reduced there would be less braking power, requiring a longer distance to stop the vehicle, increasing the risk of a crash. Nissan has notified owners, and dealers will replace the master cylinder, free of charge. The recall began on October 14, 2013. Owners may contact Nissan at 1-800-647-7261.